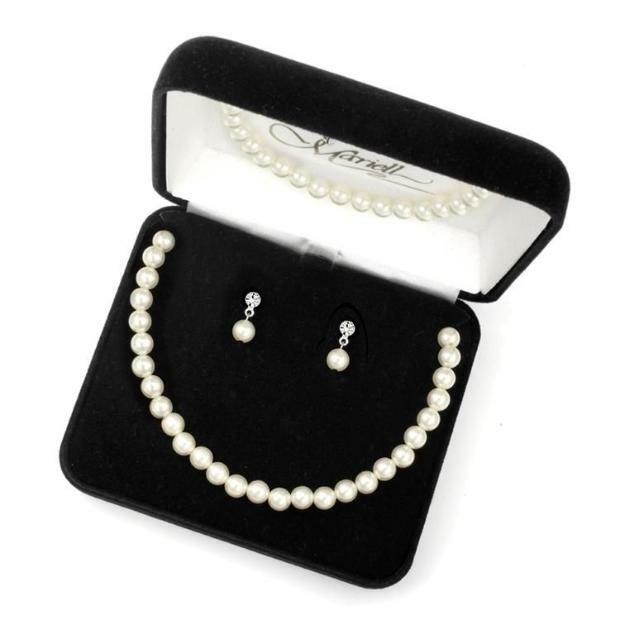 * Mariell presents our popular 3-piece pearl boxed wedding jewelry set for brides or bridesmaids in a luxurious velvet gift box at a great wholesale price. * Mariell presents our popular 3-piece pearl jewelry ensemble for brides and bridesmaids beautifully presented in a luxurious black velvet jewelry box. * This elegant pearl set includes a 6mm pearl bracelet and necklace and 6mm pearl drop earrings with a sparkling crystal stud top. * This ensemble is available in your choice of 9 beautiful pearl colors accented with silver or gold clasps. * The bridal set includes pierced earrings, a 16" necklace and a 7" bracelet. * This elegantly boxed jewelry makes a great gift item at an excellent value.